Reviewed! 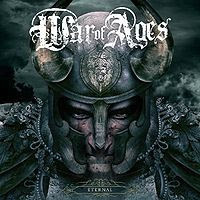 War of Ages - "Eternal"
First, a caveat to this review: no matter how hard you try, no matter how much you fiddle with the dials, you cannot listen to War of Ages “Eternal” loud enough. “Eternal” is a force, a sheer slab of textbook melodic metal, a picture of what you’d want your metal band to sound like (well, if you jammed metal of this sort) – stunning riffs, razor-sharp licks and circle pit ready breakdowns lead into immense, immersive hooks that aren’t afraid to soar. The brilliant production work of As I Lay Dying frontman Tim Lambesis can be felt throughout, making the music on “Eternal” hard to ignore; it engulfs you. It covers all ends of the spectrum, from the angular shredding of ‘Collapse’ and ‘Desire’ (Lambesis guests), to the introspective mood of ‘Instrumental,’ “Eternal” can ignite a room as well as more than a few lighters. P.O.D.’s Sonny Sandoval lends his vocals to the albums title track as well. In closing, War of Ages would like to apologize for “Eternal” to metal bands set to release a new album this year. Those bands really might want to reconsider because there’s a pretty good chance it won’t top this. War of Ages may climbing the ladder of heavy metal, hell, they might even be the second coming of As I Lay Dying, but one thing is for sure, “Eternal” is among the class of metal records thus far in 2010 and might end up being the one to beat.